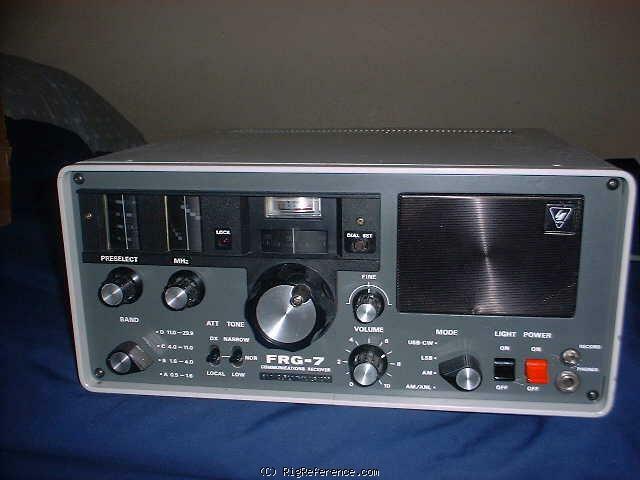 The Yaesu FRG-7 is an all mode receiver covering 200 kHz to 29.90 MHz in four bands. Modes of reception include AM, USB and LSB/CW. The display is linear analog providing up to ±5 kHz dial accuracy. Features include: RF Attenuator, Preselector, Fine Tuning [later production], Tone Control and ANL. There is a carry handle on the right side. The rear panel has high and low impedance antenna inputs. The FRG-7 operates from 120 VAC, 13 VDC or 8 D cells that plug in the battery pack that is accessible via the rear panel. Early versions did not feature the fine tuning knob. Bought my "FROG" thro Ebay in Jan 2017 from a retiring ham. Having replaced all the ageing electrolytic capacitors (15 total) it works like new. Mine must be a late one because it has a digital frequency display which looks factory fitted. It uses a Wadeley Loop and is a bit quirky to operate, but great fun. Sensitivity on a 50m long wire is as good as my modern TECSUN PL660. My FRG7 also has the Fine Tune adjustment (later versions only) which benefits greatly from an extra 20uf being added in series with the vari-cap. This makes the selectivity as good as the Tecsun. Solid, well built receiver which will go on forever! Estimating the value of a rig can be challenging. We collect prices paid by real hams over the years to help you estimate the current value of the Yaesu FRG-7. Just bought or sold this model? Let us know what you traded it for and help other ham operators!